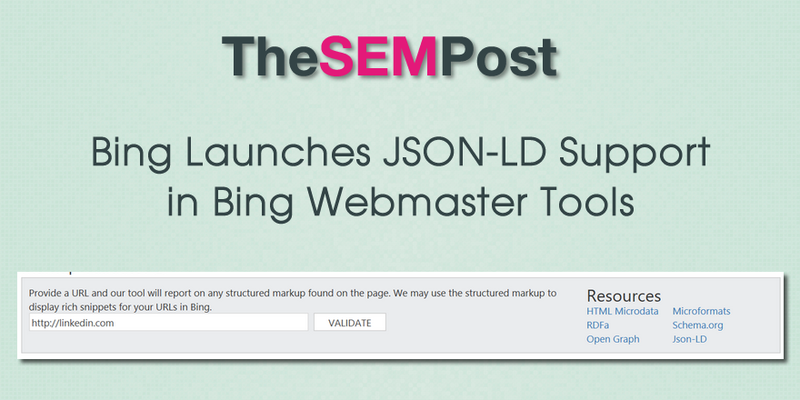 Bing has finally launched its long awaited support of JSON-LD in Bing Webmaster Tools, with a new Markup Validator Tool. Bing is proud to introduce JSON-LD support as part of Bing Webmaster Tools, as announced at the 2018 SMX Advanced. Users can login to Bing Webmaster Tools and validate their JSON-LD implementation through the Markup Validator Tool present in the Diagnostics and Tools section. After the inclusion of JSON-LD support, the Markup Validator now supports seven markup languages, including Schema.org, HTML Microdata, Microformats, Open Graph and RDFa. Site owners have been waiting for Bing to launch official support for JSON-LD. Earlier this year, they began to use JSON-LD markup in the search results, eliminating the need for site owners to use multiple schema implementations for multiple search engines. Google has supported JSON-LD for years and is now recommending JSON-LD for marking up content. But this is the first official tool Bing has launched to verify it. For site owners, if your JSON-LD verifies in Google’s validator, it should also validate in Bing, but it is worth double checking for important markup on your most important pages in Bing. To use the validator, you need to login to Bing Webmaster Tools and use the validator found in the diagnostics and tools section. Interestingly, the published blog post is dated August 2, 2018, so perhaps it was announced prematurely.